as stated in the Xcel Code of Points. These requirements are paraphrased for easier comprehension; for precise information always refer to the official book published by USA Gymnastics. 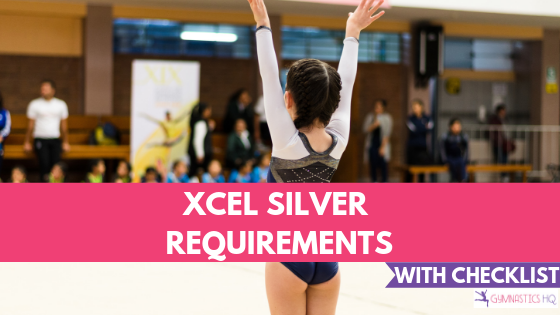 The Xcel Silver division is one level in the Xcel program; here is more information about all the gymnastics levels. 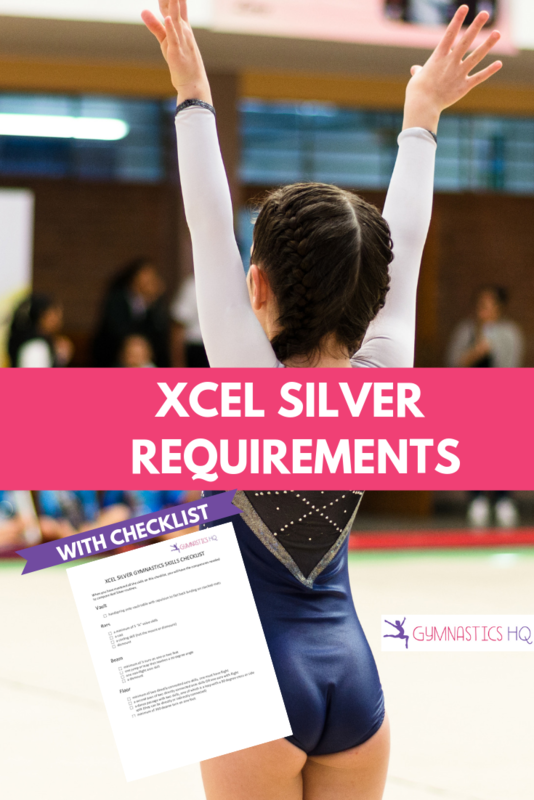 While these are requirements, some gymnasts compete in the Xcel Silver level without being able to do all the skills listed below. For what requirements gymnasts don’t fullfill, the judges take deductions. The next Xcel gymnastics level after Silver is Gold. I would like my daughter to compete but she just started gymnastics at bronze level at 13 and is 5 ft 7. The bronze level is more like a recreational class and you learn different skills. Is there anyway she can get on the road to competing? If so, at what level does she start to compete since bronze doesn’t compete? Some gyms do compete bronze, so it really depends on your gym at what level they start competing. I would say that if she can get all her silver skills then she can compete silver. I started out in silver. There is also preteam, (at least at my gym) and there is level 3. Preteam is just like level three but they don’t get scores at competition. So I would recommend starting either in level three or xcel silver. There are restrictions for the difficulty of skills that can be done in Silver routines. On floor you are only allowed to do 1 salto or aerial per routine. A back tuck would count in this category, a front handspring wouldn’t. The coach could also be concerned about doing too many difficult things and making errors on them which would result in deductions, when an easier skill could be done error free. Hope that helps. Is a round off bhs back tuck too advanced for silver? Also, can you move up a level during competition season? I really need an answer! You could do a roundoff bhs back tuck in silver, although most gymnasts wait until Gold. And yes you can move up a level during competition season, although gyms rarely do this. My daughter just got her summer recommendation and it is silver/ bronze, what exactly does that mean and Will she ever be able to do regular levels? You can read more about the Xcel program here– https://gymnasticshq.com/gymnastics-xcel-levels/ but yes she will be able to do the regular “JO” levels again. The Xcel program is a different option than the the JO levels, but it can be a more fun option since they get their own routines, as opposed to having to learn compulsory routines. I was wondering if you could do a front tuck in silver. The other acro/tumbling skills in my routine are a front walkover, a cartwheel roundoff and a roundoff, which I would like to change to my front tuck. I’ve been having extreme mental blocks on back skills after having a hard fall on my neck:) Thanks!! Yes, you can do a front tuck in silver. Do not be scared! have confidence and work through it with your coaches! My daughter was in bronze last year, and she is supposed to be in silver this year. She has all of the skills in the silver level and does them with very good form (I know that because I was a gymnast when I was a little girl). She also has some of the required gold skills. Can she skip the silver level, train for gold, and maybe even compete gold if she gets all the required skills? Please reply. Hi Autumn, I believe she might be able to skip silver, but if she can I still don’t think it’s wise for her to do that. I did two years of sliver and now I am going to gold, which payed off. I got much better scores and placed a lot better in my second year. If she has good form right now in silver, I would keep her in silver for one year just to do better and learn right techniques. Then after that she could move to gold. She can go to gold if she really wants, but I would advise staying in silver. If you would like to be in silver, I would start with the recreational classes first. They are much less demanding and cost way less money. Once you got better and go all your skills for silver, you could go to xcel bronze if they have that at your friend’s gym. And I would advise you to go to an actual gym, if you want to compete and learn the right technique for everything. Hi, my daughter is 7 and has been in gymnastics for about a year and a half now. She stared out with rec classes and quickly progressed, skipped a level or two and joined the pre-team practices. She practiced with pre-team for about 5 months and started team practice at the begging of summer in June. They have recently placed her in a “Silver Plus” group which meets 3 days a week, 4 hours per day. Silvers are 3 days, 3 hrs/week. Silver plus is not an actual level in gymnastics is it? And would anyone know what the purpose of having this separate class would be? Just asking as I am paying by hours per week and just wondering what the point of this class is or what it is leading to. If your daughter hasn’t competed before the only level she can start with is bronze or silver due to the xcel entry rules. Most likely they feel that she will do well and move up to Gold next year and silver plus is probably to start working on some of those skills for the next level. I have all my skills for xcel Gold. Am I aloud to switch to gold in the middle of the year? I have to do a layout and a tuck for silver . Also a front front ? but this is different . can anyone explain to me the “A” listed in the jo code of points? What are the requirements for diamond? My daughter has been taking classes for 3 years at a gym that does not join competitions, but their classes are modeled after JO levels. She has completed that gym’s level 3 class now, but wants to move on to competitions. So she’s tried out for 2 gyms. One has placed her on their JO Level 2 team for the summer to shore up a few details of that level with a plan to move her to Level 3 in the fall (or maybe after she does one competition in level 2 since she hasn’t ever competed before). So basically, she’s considered mostly Level 3 with a bit of transition needed through Level 2 first. The other gym has placed her on their Xcel Silver team. However, she wants to do compulsory and wants to move up through that model of competition. Both gyms do both Xcel and JO. Is it fair to ask the 2nd gym if she can do JO instead of Xcel? Is it just a preference on the part of the gymnast? If Silver and JO 3 are similar levels in skill set (is that correct? ), then can gymnasts decide for themselves which they want to do? Or should a gymnast whose never done competitions before do Xcel for at least a year and then switch to JO? We’re sort of confused on the differences between JO 3 and Xcel Silver – and maybe there isn’t a difference except for the model of competition (compulsory vs optional). Some gyms (like the first gym my daughter tried out for) consider Xcel lesser (even if the skill set is the same) which has had some influence on my daughter’s preferences. So we’re not sure which way to go. Any insight you have that will us decide? Thanks. can you not compete in beam? Hi, I have a question. I am in AAU Silver, which has the same requirements as XCEL Silver. My coach is not sure about this. Can you do a handstand twist off in Silver for your beam dismount? My coach says she thinks that is a “b” skill, and it’s too advanced for Silver but she’s not entirely sure. Do you know if you can do it? Yes, you can. My coach is letting us do either the handstand twist or the cartwheel to handstand dismount, depending on which we are better at. Is there a way for me to jump JO levels, I started gymnastics late, and was just wondering. Any updates are greatly appreciated. Thanks! Just checked above and it looks like you’ve updated the silver vault. 2 follow ups. 1. Can you still do the old vault – handspring onto vault table with repulsion to flat back on stacked mats? 2. Can someone explain the “1/4-1/2 on, repulsion off to landing facing mat stack?” Is it like a round off? No you cannot still do the old vault, as far as I know. You have to do either a front handspring or a roundoff over a sideways mat stack. And yes, the “1/4-1/2 on” is just a round off. But it is not like the round-offs over the vault table, it is a little bit easier. On the vault table you have to turn your hands all the way around on the table, and then land. 1. Front handspring vault. Look up the video: “Front handspring vault drill over 8″ mats” By Zari Goldman. The video shows it mostly the same except in Silver the mats are turned sideways. 2. Roundoff vault. Look up the video: “Half Over/ Round-Off Vault GCSE” By Shona Mackie. It is basically this except over stacked sideways 8-inchers. But you can get the basic skill and shape from this video. Are you allowed to do double back handsprings and aerials in silver competitions? It’s my daughters first competition so she has to start in silver but really wants to do those things ? On floor, Can I do a front handspring stepout to cartwheel?